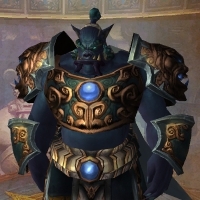 This guide is intended to provide a comprehensive description of the encounter with The Spirit Kings in Mogu'shan Vaults. It is targeted at anyone who desires to understand the fight mechanics. The Spirit Kings comprise the fourth encounter in the Mogu'shan Vaults raid instance. The encounter rather complex, and its difficult increases as time goes on, leading up to an intense final act. While the fight puts a strain on all roles in your raid, its most challenging aspect comes from the large amount of movement that you must do. Indeed, adjusting your positions and switching from a stacked to a spread-out formation are the key difficulties you will face. The Spirit Kings encounter is a council-type fight, in which you will face 4 bosses, one at a time, in a predefined order. Each new boss becomes active when the previous one has been defeated (i.e., killed). Each of the bosses has his own health pool and his own set of abilities. Each boss has one ability which he retains after being defeated, and which he will continue to use against the raid for the remainder of the fight (while you are fighting the other bosses). This means that the fight becomes harder as you near the end, reaching its difficulty peak when you are fighting the final boss. Because the order of the bosses is always the same, you can easily predict which combinations of retained abilities you will have to deal with. We detail this in the guide. The fight involves a lot of movement, and proper positioning is an important requirement for success, throughout the course of the fight. Qiang the Merciless is always the first active boss. Qiang the Merciless makes use of 3 abilities. We describe them below, starting with the ability that he retains after being defeated. Flanking Orders summons a row of Mogu warriors. They walk forward independently of any raid actions, and are unattackable. The wave spawns at a random edge of the arena and slowly moves across it in a predictable fashion. The row is not very long, meaning that players can easily avoid it by moving to either side of it. The warriors constantly deal a massive amount of Physical damage to all enemies in front of them, essentially one-shotting any careless raid members who do not move out of their path. The boss uses this ability every 40 seconds while he is alive, and every 75 seconds after he is defeated. Massive Attacks is a frontal cone attack that deals a massive amount of damage, split between all affected players. The boss uses this ability every 5 seconds. Annihilate is an AoE attack that deals a very large amount of damage in an area on the ground. The spell has a 3-second visual effect on the ground, before it deals its damage, making it easy to get out of its way. The boss uses this ability every 40 seconds. Have your tanks tank the boss in the center of the room. Have your entire raid stacked up in front of the boss, so as to minimise the damage taken from Massive Attacks. Make sure that everyone promptly moves to avoid both Annihilate and Flanking Orders. Your raid will essentially treat this boss as a tank and spank fight. The only difficulties will arise from avoiding Flanking Orders and Annihilate, both of which we detail in the sections below. Being in the center of the room allows your tanks to choose an efficient path to avoid the Flanking Order wall. The rest of the raid must move accordingly, otherwise the Massive Attacks can kill those still left in front of the boss. Once the Flanking Orders have passed, the boss should simply be moved back to the center. Whenever the boss casts Annihilate, the ground in front of him begins to rumble in an unmistakable fashion. All raid members (including tanks) should move out of the affected area. Everyone should run through the boss, since this is the shortest path to avoid the affected area. The raid can then simply remain on the other side of the boss (which will now once again be facing them, as he has turned to the tank after casting Annihilate). Subetai the Swift is always the second active boss. Subetai the Swift makes use of 3 abilities. We describe them below, starting with the one which he retains after being defeated. Pillage causes Subetai to charge a random raid member and debuff all players within 8 yards with Pillaged. This debuff, which lasts 15 seconds, reduces damage and healing done by 50%, and increases Physical damage taken by 50%. The boss casts this ability every 40 seconds. Volley is a 3-step frontal cone attack. First, Subetai fires a volley of arrows in a wide cone in front of him, dealing a moderate amount of Physical damage. A second later, he fires again, but this time the cone is less wide and the damage is higher. A second after that, Subetai fires a final volley, in a narrow cone, dealing massive damage. Rain of Arrows targets a random raid member, and fires a volley of arrows at that location. All players in an 8-yard radius of this location are stunned by Pinning Arrows, which deal Physical damage to the players every second. The Arrows are attackable and killable, something that is required in order to free the players. As you can see, the abilities of Subetai require your raid to be spread out, which makes them rather trivial to deal with. However, depending on which defeated bosses you are facing at this stage of the fight, this may not always be easy. Subetai will channel Pillage for a few seconds, and during this time, players in his vicinity have time to run away. The Pillaged debuff is only applied at the end of the cast. Having your raid spread out as much as possible, so that as few players as possible are within 8 yards of one another, makes avoiding Pillage easier. The players who are unfortunate enough to be pillaged do not have any way of getting rid of the debuff and its negative effects, so they must simply endure them. There are two things that players who have been Pillaged must pay special attention to. Do not use any cooldowns (such as DPS or healing cooldowns), since their effect will be greatly diminished. Be extra careful not to be hit by Volley, since its damage is Physical and you are taking increased Physical damage. Volley is easily dealt with. All it requires is that players move away from the front of the boss when this ability is cast. Getting hit by the first wave of arrows will not always be easy to avoid, but this is hardly problematic, and it should not kill anyone. Rain of Arrows is generally neutralized by the fact that your raid is spread out. Players who are pinned down by the arrows must be freed immediately by killing the arrows. It is interesting to note that players can escape the Arrows by using abilities that grant them immunity, as well as abilities such as Blink. While Subetai is active, you will have to deal with Qiang's Flanking Orders. This ability is not very problematic while facing Subetai, so simply avoid the rows of Mogu warriors as you normally would. Zian of the Endless Shadow is always the third active boss. Zian of the Endless Shadow makes use of 3 abilities. We describe them below, starting with the ability that he retains after being defeated. Undying Shadows selects the location of of a random raid member, and a few seconds later summons an attackable add there. The add fixates on the nearest raid member, and follows that player around, dealing damage to all players within 10 yards of it. When the add is killed, it forms a large void zone. Over the course of 30 seconds, the void zone shrinks in size, until it finally transforms back into the original add. This add then fixates on the nearest target once more, and the process repeats itself. After the void zone shrinks for the second time, it disappears entirely, and no add spawns. Zian casts this ability every 40 seconds while he is alive, and every 85 seconds after he is defeated. Shadow Blast is an interruptible spell that Zian often casts at the location of a random raid member. Shadow Blast deals a large amount of Shadow damage to everyone within 8 yards of the target's location. Zian casts Shadow Blast every 4-5 seconds. Charged Shadows is a spell that deals a high amount of Shadow damage to a player, and then jumps to any targets within 8 yards of that player, damaging them as well. Charged Shadows simply requires that your raid spreads out, and Shadow Blast must always be interrupted. There is no complexity in dealing with these abilities. The best way of dealing with Undying Shadows can be summarised thus. Have the person that the Undying Shadows fixate on kite them to the edge of the room, and then kill the Undying Shadows immediately. Doing this will result in the void zones generated by Undying Shadows being out of the way of your raid, and not hampering your movement when avoiding other abilities. Even though it is tempting to DPS the Undying Shadows as soon as they appear, doing this can cause them to leave their void zone in entirely undesirable locations, which should be avoided. Ranged DPS players are best suited for DPSing the Undying Shadows. Flanking Orders does not interfere with your raid's strategy for defeating Zian in any meaningful way. Pillage is the least problematic of the retained abilities. It simply requires that your raid members be spread out at least 8 yards apart. Even when more than one raid member is Pillaged, this is not very serious for your raid. Meng the Demented is always the fourth and final active boss. Meng the Demented is a bit different from the other Spirit Kings, in the sense that he has an insanity bar that increases slowly over time. When the insanity bar reaches maximum capacity, it resets, and the boss' insanity begins to grow once more. Meng has two passive abilities, only one of which is active at one time. The two passive abilities alternate, changing each time Meng's insanity reaches maximum capacity. Crazed increases Meng's physical damage by 200% of his current insanity. Cowardice causes Meng to reflect damage back to the raid, equal to 50% of his current insanity. So, if Meng has 60 Insanity, he will reflect 30% of the raid's damage. Meng also has 2 active abilities that he uses regularly. We describe them below, starting with the ability that he retains after being defeated. Maddening Shout is a spell which turns all raid members hostile to one another, allowing them to attack each other. Moreover, it causes all raid members to suffer Shadow damage every 3 seconds. The effect ends when each player has sustained 40,000 damage from another player (20,000 in LFR). Meng casts Maddening Shout every 50 seconds while he is alive, and every 85 seconds after he is defeated. Crazy Thought is an interruptible spell that increases Meng's insanity by 10. He casts this ability very often (every 5 seconds or so). The strategy for defeating Meng revolves around Maddening Shout. It is also important to understand how to properly react to his current insanity state. The strategy for dealing with Maddening Shout is simple. Your entire raid should be positioned around Meng, spread out loosely. When Maddening Shout is cast, everyone should move in. Certain players should be assigned to cast AoE spells that deal the minimum amount of damage needed to break the effect. After the effects of Maddening Shout have worn off, your raid can spread out again. It is important to note that Maddening Shout is not a mind control, and it does not cause loss of control of your character in any way. It simply makes all raid members hostile to you. It is also very important that no one uses any abilities that have secondary effects such as stuns, fears, or other debuffs. As we mentioned above, Meng's insanity increases steadily over time. Additionally, it can increase faster if he completes casts of Crazy Thought. With this in mind, you must be prepared that Meng will have very high insanity several times while he is alive. When Meng is Crazed, the more insanity he has, the higher the damage done to the tank will be. When Meng is under the effects of Cowardice, the more insanity he has, the more damage will be reflected back to your raid. The key to handling these aspects correctly is the way in which you interrupt the Crazy Thought casts that the boss regularly performs. The idea is to always interrupt the casts when the boss has low insanity, and to allow him to cast the spell when he has high insanity. The exact amount of insanity where you should stop interrupting depends on many factors, but we recommend 60. Doing this will cause Meng to spend more time at low insanity, and less time at high insanity. In other words, you are intentionally increasing his insanity generation, when he is already high on insanity, in order to get him to maximum insanity (when it is reset to zero) faster. There are two things you should be aware of regarding Meng's high-insanity phases. When the boss is Crazed, the tank will require a large amount of healing. When the boss has Cowardice, the raid should stop DPSing in order to avoid taking excessive damage. One possible problem will be if the path you wanted to take in order to avoid the Flanking Orders is blocked by a void zone from Undying Shadows. In this case, the best thing you can do is calculate a new path, avoiding Flanking Orders on the other side. If this is not possible, then you should simply run through the Undying Shadows, as their damage is considerably lower than that of Flanking Orders. When dealing with Undying Shadows, one of the biggest problems will arise if your raid is stacked up (such as to deal with Meng's Maddening Shout). When this happens, DPS players will have to resist the temptation of quickly killing the Undying Shadows, and the player on whom it has fixated must move the Shadows out of the raid. Even though we do not advise you being careless, it should be noted that even if the Undying Shadows are killed right under your raid, the void zone will not be very problematic. This is because the damage from the Undying Shadows void zone is quite low (even in heroic mode, it is only 60,000 per second; in normal mode, it is much lower than that). The position of the boss will simply have to be re-adjusted. Pillage is a problem when you have to stack tightly, such as for Maddening Shout. In this case, you will have to respect the stacking constraint, since failing to do so is much more punishing than failing to spread for Pillage. Fortunately, these abilities to not seem to be cast at the same time very often. The choice of the optimal timing for Heroism/ Bloodlust/ Time Warp is not very straightforward. On the one hand, using it early allows your raid to stand still and DPS (since there are fewer abilities to avoid), taking greater advantage of the cooldown. On the other hand, using it late in the fight means that you get a boost of DPS during the most difficult part of the encounter, allowing you to get through it faster. The choice is yours, and if one strategy turns out to be better than the other we will update the guide to reflect this. As with many other fights, the most important thing to emphasize is that your raid members all learn to properly handle each mechanic on its own. This is especially true for the retained abilities of the bosses. Once this is accomplished, your raid should have no problem overcoming the other challenges of the encounter. The Heroic mode of the encounter against The Spirit Kings makes for a very challenging fight. While the fight is very difficult, we feel that raids that have successfully killed the first 3 bosses on Heroic difficulty have what it takes to defeat The Spirit Kings. The fight has a rather strict enrage timer, as well as several deadly mechanics. In addition to the bosses' increased health, and the increased damage of all their abilities, there are several key differences from Normal mode. Some of the old mechanics are slightly changed, and each boss gains a new ability. The most important change is that a new boss no longer becomes active when the previous one dies, but rather when the previous one reaches 30% health. Therefore, you will have to contend with two bosses active for short periods of time, several times throughout the fight. The second change is that Qiang's Flanking Orders ability now creates two rows of Mogu warriors, instead of one. These two rows appear at the same time, and behave exactly as they do in Normal mode. The locations and directions of the two rows appear to be random, and they can sometimes come from opposite sides, meeting in the middle, or even from the same side and running almost on top of one another. Each of the 4 bosses gains a new ability in Heroic mode. Each of these abilities is on a rather long cooldown (40 seconds), meaning that they will only come up twice while each boss is alive (in normal circumstances, anyway). We also feel that it is important to note that none of these abilities is retained by the bosses after they are defeated. Qiang the Merciless gains Impervious Shield. The boss places a shield on himself, which renders him immune to all damage. While the shield is up, all attacks done to Qiang will be retaliated back to the attackers. The shield can be dispelled by Mass Dispel and Shattering Throw. Zian of the Endless Shadow gains Shield of Darkness. The boss places a shield on himself, which deals 300,000 Shadow damage to the entire raid whenever a damaging ability hits Zian while the shield is active. The shield is a magic effect and can be dispelled. Meng the Demented gains Delirious. This is a buff that the boss gains, which causes him to gain twice as much insanity as he does normally. The buff is an enrage effect and can be dispelled. Subetai the Swift gains Sleight of Hand. This is a 10-second buff that the boss gains, which causes any attacks done to him while the buff is active to debuff the attacker, reducing their damage done and armor by 50% for 25 seconds. While Sleight of Hand is active, Subetai can be stunned. Simply put, your raid will have to deal with all the usual challenges of the encounter, in addition to which you will need to react accordingly to the bosses' new abilities. We will summarise this below, before going into more detail. Whenever Qiang casts Impervious Shield, stop attacking him and dispel the shield immediately. Whenever Subetai gains Sleight of Hand, stun him and only attack him while he is stunned (he cannot debuff players while he is stunned). Whenever Zian casts Shield of Darkness, stop attacking him and dispel the shield immediately. Whenever Meng gains Delirious, dispel it immediately. Dispelling the bosses is the duty of any players in your raid who have offensive dispels. In the case of Zian, Shamans' Purge, and Priests' Dispel Magic and Mass Dispel are very useful. For Meng, the enrage effect can be dispelled by Hunters' Tranquilizing Shot, Druids' Soothe, and Rogues' Shiv. Qiang's shield can only be removed through abilities that generally remove invulnerabilities, namely Mass Dispel and Shattering Throw. One of the most important parts of the fight, and the one most likely to cause you problems, is the requirement to stop attacking Qiang and Zian when they shield themselves, as well as Subetai, when he gains Sleight of Hand. Even though it is detrimental to attack any of these bosses at these times, Zian is by far the deadliest, so we will focus on him, but the general idea also applies to Qiang and Subetai. The shield is on a predictable timer, so, even though the enrage timer is quite strict, it is advised to stop attacking the boss a few good seconds before the shield goes up. DoTs, bleeds, and pet attacks do not trigger the detonation of Zian's shield, so that is not a problem. Having a quick dispel on the boss minimises the risk of someone detonating the shield, and also reduces the amount of time your raid is unable to attack the boss. Having said that, you should be prepared for many wipes to this ability, as it is quite unforgiving. For Subetai, Sleight of Hand cannot be dispelled, but the boss should be stunned for as much of the 10-second duration of Sleight of Hand as possible (stunning him for 10 seconds is possible, but the stuns are subject to diminishing returns). Players should make sure not to attack him when he is not stunned. Another very delicate point in the fight is whenever the current boss reaches 30% health. At this point, the next boss will activate, and you will have to deal with both of them until the first one is defeated. Since we still advise using a single tank in Heroic mode, the tank will have to tank both bosses at once. Doing so will result in a lot of damage, so both the tank and the healers should be prepared with cooldowns. Additionally, when the boss that is being brought to 30% health is Zian, we advise waiting for the Shield of Darkness to be cast and dispelled before bringing the boss to 30% health, and then using DPS cooldowns to bring him to 0% before another shield is cast. The Getting Hot In Here achievement is part of the Glory of the Pandaria Raider meta achievement. It simply requires that all your raid members use a /dance emote on Subetai the Swift after getting hit by his Pillage ability. You should use a macro for this purpose. The obvious difficulty is that getting the entire raid hit by Pillage can cause many problems. Fortunately, since the achievement does not appear to require that you defeat the encounter in the same attempt, you can simply complete the achievement, wipe, and re-start. However, this should not be needed, especially if Subetai is the first or second active boss. Having your entire raid Pillaged will reduce DPS for a short while, which is not a problem. The greater problem is the increased damage that the tank will be taking from Subetai, and the reduced healing that the healers will be doing. We believe that this can be countered with healing and defensive cooldowns. In the worst case scenario, if the tank dies, they can be resurrected later. This concludes our guide for the encounter against The Spirit Kings. We always welcome your comments and suggestions on our forums or by e-mail.